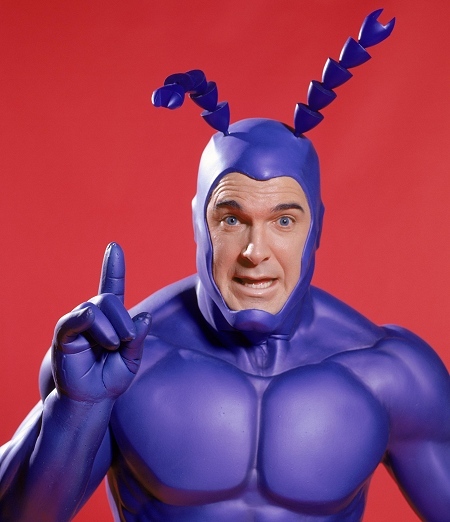 The live action version of The Tick is now on Hulu. Patrick Warburton’s greatest performance ever. Comic gold. It may be my favorite superhero story, and I swear it’s etched onto my DNA - watching it, I realized that a giant project I was working on was very much Tick-inspired. Rushmore and Gilmore Girls, too. But they were all subconscious inspirations and that’s what made it spooky. Internet research reveals some things: Colleen Atwood, Academy Award winning costume designer, made this iteration of The Tick’s costume. Ben Edlund calls the show “a superheroic portrait of genuine human lameness,” which is funny. (He works on Supernatural now, I guess?) After listening to Fresh Air’s replay of a 2002 interview with Tom Waits, I’m pretty convinced he is The Tick. But that is a whole other post. He at least talks in Tickisms.